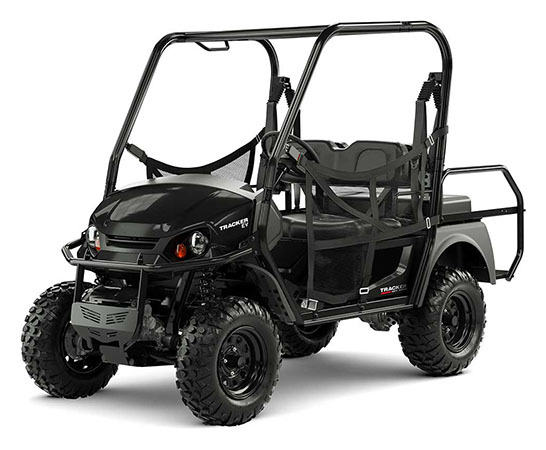 Plenty of power with no fumes or noise makes the TRACKER EV a great companion on the trail, the hunt, or for getting work done. The silent ride comes from a 72-Volt AC electric drive train. Add comfortable seating, 1,000 lb. towing capacity and a fold-down cargo deck and you can work or play with quiet confidence. INSTRUMENTATION: Digital Gauge, Analog Speedometer, Odometer, Tachometer, Tripmeter, Gear Indicator, Fuel Gauge, AWD Indicator, Hi-Temp/Low-Batt Lights, DC Outlet. STORAGE COMPONENTS: Fold Down Cargo Deck, Glove Box. SAFETY: 3-Point Seat Belts (2 Front, 2 Rear), Safety Nets, 1.75 in. Diameter Roll Formed OPS (Operator Protective Structure) Tubing, 1.5 in. Diameter Tubing Brush Guard, Halogen Headlights, Taillights, Impact-Resistant Fender Flares. Dash-mounted max speed / max range switch. 25 in. aggressive tread tires.